My book reading has sort of stalled while I try to get my house back in order after winter. I usually have a few weeks at the beginning of spring when it is next to IMPOSSIBLE to settle down with a book, but I try to stay in the habit by browsing through craft books and cookbooks. Nigella Lawson's Nigella Express: 130 Recipes for Good Food, Fast — I'm sure Lawson's chattiness irritates some readers, but I cracked up over her introduction to the Butterfly Cupcakes recipe. Haven't made anything yet but I'm enjoying paging through it. I'll probably end up buying a used copy; I already have two of her cookbooks, so I might as well make it a collection, right? At the Farmers Market with Kids: Recipes and Projects for Little Hands by Leslie Jonath and Ethel Brennan: pretty design, cute pictures, and I like the way the authors list the parts of the recipes that are well-suited for younger kitchen assistants. Nice kid-friendly recipes; I'm trying asparagus spears with yogurt dip tonight for the kids. Young House Love: 243 Ways to Paint, Craft, Update & Show Your Home Some Love by the Petersiks of the titular blog. Honestly, this book is kind of like a Pinterest board in book format, or like going through their blog's past posts, probably -- I've only visited their blog a couple of times, so I don't know for sure, but it does have that bloggy feel. Anyway, I think it's fun. Most of the projects are easy and inexpensive, and they're marked according to cost and difficulty level. There is nothing terribly NEW in there, really, but sometimes it's nice to have a bunch of stuff you'd like to do grouped together in one well-designed book. And one by Alice Waters -- In the Green Kitchen: Techniques to Learn by Heart. I picked this one up because ALICE WATERS and I assumed it was just veggie recipes based on the "green" in the title. The Green Kitchen was actually this thing where a group of well-known chefs and cooks each demonstrated different useful techniques, like chopping up a chicken or washing lettuce. This cookbook showcases each technique; a picture of the chef or cook who demonstrated the process at the Green Kitchen event accompanies each how-to section, along with recipes that showcase each technique. In the Green Kitchen would be more useful for novice cooks, but it does have its charms for intermediate cooks (says this intermediate cook). Because the intent of the book is to teach useful kitchen skills, there aren't a ton of recipes, but I do like the ones that have been selected. Haven't tried any yet, though. 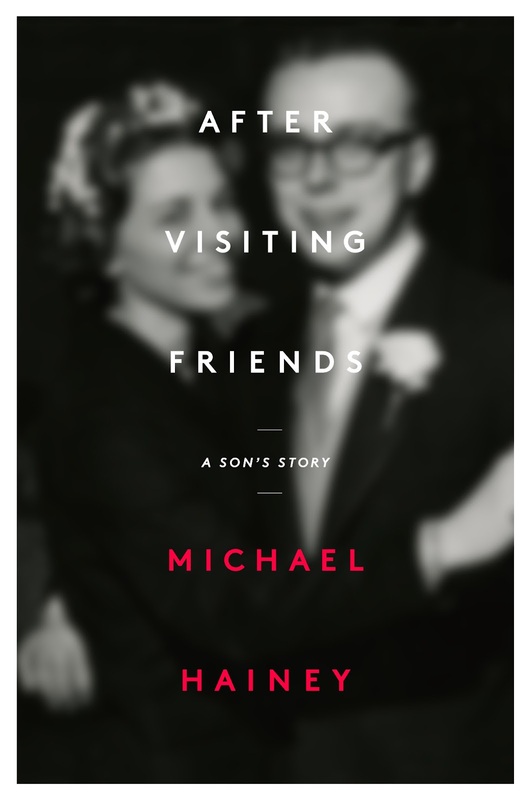 The idea behind After Visiting Friends is compelling: Hainey, the son of a newspaper man and a journalist himself, launches an investigation into the circumstances of his father's death after noticing inconsistencies in the story. He talks to surviving relatives, friends of the family, and his father's coworkers, and takes a few trips to flesh out the story. While describing the steps he took to find out more about his father's death, he also recounts personal memories and family history. The secrets he uncovers throughout his journey to find the truth are not spy novel material, and the investigation is a low-key, meandering affair, but the story overall is an interesting window into the sixties- and seventies-era newspaper world, and it's a good read. Hainey does have a style that takes a little while to get used to -- short bursts of words, fragments, brief sentences tapped out between longer sentences -- so After Visiting Friends was a slow starter for me. A few chapters in, I warmed up to it, and once that happened, I couldn't put the book down. I LOVE this cookbook and am planning to buy my own copy. Put 'em Up! Fruit is a good introduction to preserving fruit, with a heavy focus on canning using the boiling-water method. It includes other preservation methods -- drying and freezing -- but the star of the show is definitely canning. First off, this is a beautiful cookbook, but it is also laid out very cleverly, and it's not style-over-substance: the photos are as helpful as they are pretty. There's a boiling-water canning guide in the front that incorporates great reference photos, and I wish I had seen it before I ever started canning. Maybe I wouldn't have tried using the wrong end of my canning tongs to pick up hot jars. There are troubleshooting guides (ah, FRUIT FLOAT, that's what happened to my strawberry jam last summer) and photos demonstrating what terms like "julienne" and "dice" mean when it comes to prepping your produce. The info in the front would be enough for me to recommend this cookbook, but the included recipes are also great; Put 'em Up! Fruit contains a nice range of recipes, organized by fruit, from jellies to to vinegar to dried lemons, which look a little alarming but are supposedly delicious. 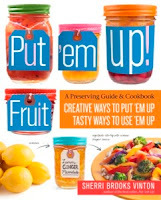 Even better: behind each recipe, there's a recipe that shows you a way to put your newly preserved produce to work. For instance, a recipe for blueberry syrup is paired with a recipe for blueberry lemonade, which uses the syrup as a flavoring. As usual, I picked a recipe to test out. My grocery store had blood oranges, which I love, so I figured I'd try the recipe for blood orange marmalade. This was my first attempt at marmalade, so I didn't know what to expect, but the instructions were easy to follow and Vinton's easy-going but knowledgeable style helped me not to stress about it. I made a smaller batch than the recipe called for but didn't run into any problems downsizing it. The blood orange marmalade turned out really well! And it's very, very pretty. My only criticism is that I think the oranges should be cut in eight pieces, not four, as the pieces of rind in the marmalade were a touch too large for me -- but I think that's a matter of personal taste. I'm looking forward to trying the accompanying recipe for salmon with orange glaze that incorporates the marmalade into a sauce. There's also a variation, brandied blood orange marmalade, that I'd like to try, if I can find more blood oranges. I try not to hoard cookbooks these days, as I turn to the internet for recipes more often than not, and I have already have too many books to fit on my bookshelves as it is, but I make exceptions for cookbooks I know I will use, and this is definitely a good one for my little canning shelf. 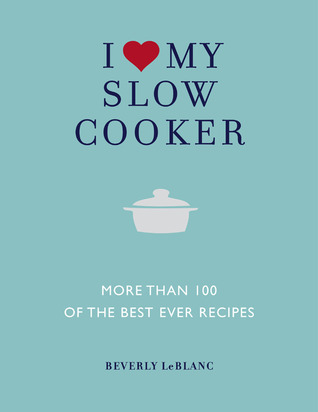 I Love My Slow Cooker isn't a life-changing cookbook, but I like it a lot. I find most of my recipes online these days, but I think LeBlanc's collection deserves a place alongside the other specialty cookbooks on my (virtual) bookshelf. It's got the standard cookbook set-up: you can find general slow cooker info and some solid helpful tips in the beginning of the book; I've been using a slow cooker for a while and I still managed to find a few tidbits I could use. Then onto the recipes! The photos throughout this cookbook are very nice, and the recipes themselves go outside the range of your the typical old-fashioned slow cooker guide, which pleased me immensely. This one is full of things like Hot and Sour Duck and Mushroom Soup, Vegetable and Cashew Red Curry, and Vanilla and Pepper-Poached Pears. It also has plenty of the usual fare, like Pulled Pork and a One-Step Beef Stew. I think anyone could find something to like, but those who don't find dishes with non-standard ingredients appealing won't get as big of a kick out of this book as a whole. 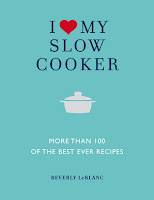 In general, I think I Love My Slow Cooker breaks down recipes well, with clear writing and easy-to-understand directions. No complaints there. I highlighted about a dozen recipes before deciding to try LeBlanc's Red Lentil and Sweet Potato Soup, since I had almost everything on hand. The recipe was very easy to follow, took practically no time to prepare -- I'm a slow chopper, so it took a little longer than the 15 minutes stated in the recipe, but it still didn't take too long. The end result was hearty and delicious. I'm looking forward to trying more! Before A Constellation of Vital Phenomena, I knew one thing about Chechnya: how to mispronounce its name. Now I'm an expert on recent Chechnyan history thanks to Anthony Marra and the Google. I usually love books that make me want to go off on Rabbit Trails of Learning, and this one is no exception. But it's not just that -- I loved SO MANY THINGS about Constellation. Don't get me wrong, it's hard to read at times, just because of the harsh setting (conflict-ridden Chechnya) and pervasiveness of war. We get to know a generous handful of characters, and I found myself loving almost all of them, but war is almost a character itself, wrapping itself around the everyday lives of those people, and I had to take breaks every now and then. There's a brief but awful torture scene maybe halfway through the novel that I should have skimmed. Nothing is gratuitous but it's still pretty harsh. It's war. Ultimately, though, there is enough hope, enough light let into the pages, that it's uplifting despite all of that. The narrative starts in 2004, as a father is disappeared and his daughter goes into hiding. It loosely follows the attempt to keep her hidden, but Marra plays with the timeline, popping in and out of different points in a ten-year time span. This could be a mess, but there's a header at the beginning of each chapter that clearly marks the year being covered in that chapter, and it works. One of the things I liked the most about Constellation is the way everything, and everyone, eventually intersects. 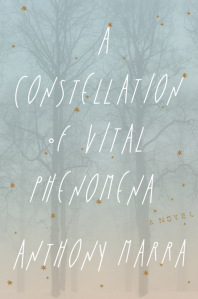 Marra focuses on three peopl, but there are so many characters inside this book, and they wander in and out of each others' lives throughout those ten years, creating ripples that reach into the future. It's a web of a novel, and it's lovely. And the prose! There are so many beautiful turns of phrase in Constellation that I eventually gave up highlighting my favorites. If I had been reading a print book, and not an e-galley, my copy would have looked like some sort of bizarre basketweaving-with-text experiment. Yes, it's safe to say I capslock loved this one. Way to start a career with a bang -- I'll definitely keep an eye out for Marra's work in the future. I was all set to dislike A Grief Observed after reading the annoying introduction by Lewis's stepson (so much Satan up in there). However, I found myself relating, a lot, to where Lewis's thoughts roamed in his journals, although I have never lost someone as close and beloved to me as H. was to Lewis, and even if I had I would be hard pressed to find the right words to describe any of it as well as he did. 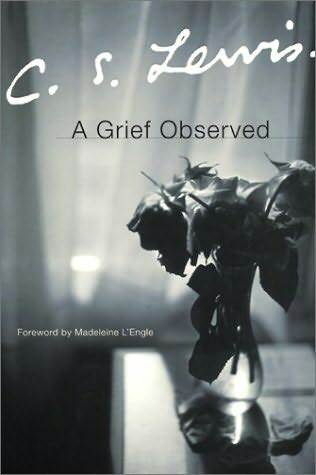 I've read that this book has more resonance for those who are actively grieving, and I can see that, but I did plenty of figurative head-nodding while reading along. The thoughts Lewis wrote down while questioning the strength of his faith are familiar to me. I expected his musings to be staid and boring -- again, taking my cue from the introduction -- so the love and sense of humor that shine through Lewis's writing, even at his lowest points, were pleasant surprises. Lewis can be elitist at times but I feel the pluses of A Grief Observed -- the honesty, the unexpected humor, the way one man's specific grief is turned into something that resonates within so many others -- make up for any snobbishness on the author's part. It's a good read if you're in the right spot for it. 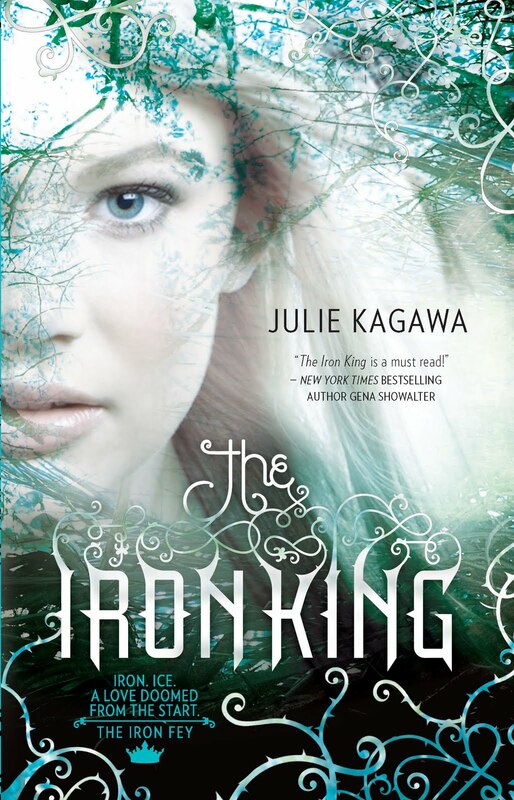 I put off writing a review for The Iron King because I don't have much to say about it: I liked it well enough while I was reading it, I didn't actively hate the main character and I don't remember wanting the book to be over or anything, but two days later, I had to reacquaint myself with the characters (and their flowing locks) and plot points before I could write a review. Junk food for the brain. Yes, this is yet another offering in the trendy "faeries with a twist" genre, but Kagawa writes it well enough that I stayed attached to it until I was done: sixteen-year-old Meghan follows her young half-brother into the Nevernever after he's abducted. Over the course of the book, she discovers she's half-fey -- and a princess, at that -- and gets to deal with searching for her brother AND being used as a kind of political tool. There are a lot of enjoyable literary references mixed into the story, too, like Kagawa's homage to Carroll's Cheshire Cat. And as is standard for this type of novel, there's a love triangle, although I wasn't really convinced that either of the Meghan-related arms of the triangle worked. While I might not easily remember all the details of the book, I do remember a few quirky things: some words that were used in strange ways that might have been technically correct but were still odd (like "scanty wardrobe" meaning a limited selection of clothing) and an instance where Meghan notes that another character has addressed her by her name for the FIRST TIME -- I know, right? pitter pat -- except he has actually done so at least twice before, and one of those instances was all of two pages ago. It's obvious that The Iron King is the first of a series; most plot points are wrapped up nicely but the ending is built for a sequel. I am not convinced that I NEED to read the next book in the series, but if I see it at the library, I'll pick it up. karen has read 2 books toward her goal of 33 books. karen has completed her goal of reading 49 books in 2012!